Following Windows market share on NetApplications, as I do every month, it’s clear to me that Windows 8.x isn’t the hit Microsoft hoped for. There are several reasons for this, all of which I’ve discussed previously -- dwindling PC sales, users dislike of touch and the Modern UI, and so on. Last month Windows 7’s growth outpaced that of Windows 8.x by four fold, and it’s not the first time the older OS has proven the more popular choice either. It’s becoming something of a regular occurrence. Adoption of the tiled OS is slow, very slow. Especially compared with the strong pick up Windows 7 enjoyed from the start. Statista has taken global market share of both Windows 7 and Windows 8/8.1 since launch and plotted the growth on a chart, and the difference is stark. While Windows 8.x has a respectable sounding 9.3 percent of the global market as of the end of last month, Windows 7 had claimed over twice that in the same time period (fourteen months). And that’s not the worst part. While the Windows 7 graph shows a steep upwards trend, Windows 8.x growth is clearly slowing, and heading for a plateau. The launch of Windows 8.1 gave the OS a significant bump, but now the appeal is waning it seems. It’s easy to make excuses for Windows 8.x’s failure to perform. Windows 7 adoption was higher because it followed the half-baked Windows Vista -- users on XP wanted a newer OS to switch to, and users on Vista wanted to get off it, quickly. 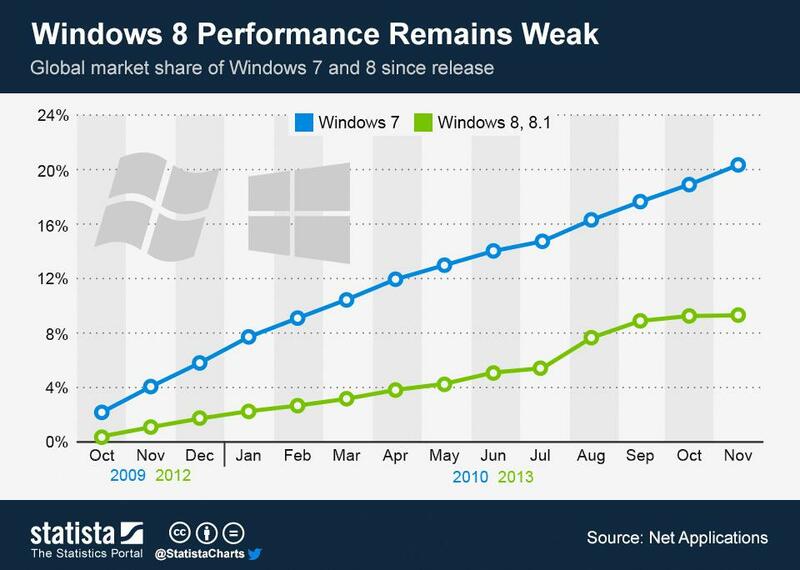 Windows 7 was, and still is, hugely popular, and Windows 8.x is struggling to follow it. But, however you look at things, Windows 8.1 was released a mere two months ago, and instead of the upwards curve you'd expect following a major launch we’re seeing significant slowdown. It’s possible sales over the holiday period will boost market share for the tiled OS, and restart the (short-lived) growth spurt Windows 8.1 experienced at launch, but it would take a brave man to bet on that outcome. Microsoft is advertising its new OS everywhere, the software is on all new PCs, but still consumers don’t seem interested. What else can the software giant do to boost Windows 8.x adoption?